Goodness, it feels like it's been forever since I've reported on a single malt. So, we'll get to two (or three?) this week. I'll start with a whisky that was on my previous Dram Quest. 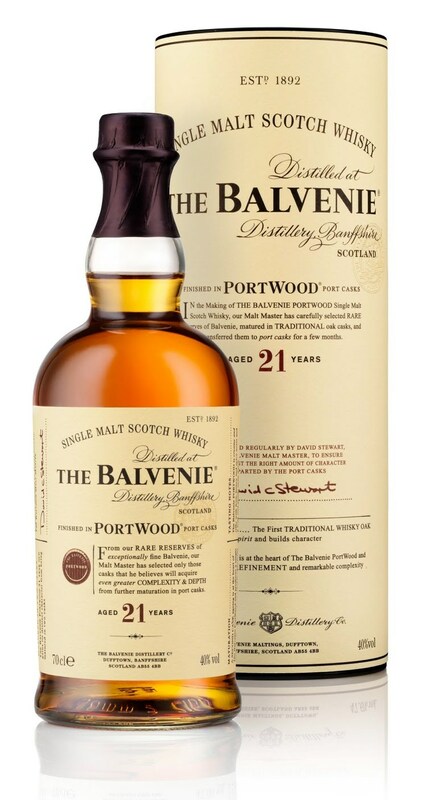 The Balvenie 21yr Portwood. There have been a few posts here about my struggles with "finished" whiskys. To me, finished whiskies almost never feel like a complete piece. The elements often remain separate. Rarely does the character from the wine cask integrate with the malt. There is undoubtedly a true art to whisky-making. A wine-cask-finished major release requires the blender to commingle well over 100 separate casks into a single product with a nose and palate that's not only consistent, but also fits into the company's brand. The producer likely has to test up to 1000 separate barrels of whisky, with each vessel bringing along its own quirks. So when this process actually works, it's an impressive bit of craft. When I find a finished whisky that works, I'm first in line to be one of those momentarily sated consumers. But those finishes usually don't work for me. Especially port pipe finished whisky. I've tried about a dozen, and would rather not sample them again. Well, except for this one. I'd first tried it at a Balvenie tasting and was surprised by how well the malt, port, and wood was woven into a single whisky unit. I shouldn't have been surprised since this whisky had been recommended to me by many folks. Yet I went into the experience with my grudge against port-ed whisky. But I found the Portwood so nice that I made sure to pick up a dram in a Master of Malt order. The color is dark gold, like a bourbon. The nose starts with maraschino cherries in a jar of molasses. Then there's lots of orange zest, fruit punch, ripe stone fruits, and maple syrup. After about a half hour, it smells of a dessert of bread pudding with a light port. Great silky body and texture on this one. Milk chocolate and raisins start the palate. There's some sweet cream, vanilla pudding, cinnamon, salt, and whole wheat bread with honey butter. The late-night finish blooms with raisins in honey, citrus and brown sugar, and finally a healthy dose of pipe tobacco. Yeah. Seriously, screw water. I only drank this one neatly. It needed no assistance. Balvenie Master Blender David Stewart really is a master of his craft. The 12yr Doublewood (the original single malt report!) is honeyed, creamy, and easygoing. The Signature and Single Barrel are less rounded than the Doublewood, but are more interesting for the same reason. The Carribean Cask is desserty delicious. The 17yr Doublewood is, well, a 17yr version of the younger Doublewood. My Tun 1401 experiences have left me speechless. The 30yr is dynamite. And now he's made a port-finished whisky that is all of one piece. I know Mr. Stewart is in the process of retiring but I'm sure he feels good to have brought so many good products to so many happy drinkers. If you want to try this one again, keep an eye out for the Doublewood/Single Barrel/Portwood mini three pack. There might still be some left over from the holidays. I picked a couple up a few years back for under $20 a piece. I've only heard of that pack, never seen it. I would be happy to scoop that up the moment I see it. I'd even be willing to drop $25-$30 on it. It would keep me from buying the Single Barrel at its new $70 price. Speaking of Single Barrel, I had a WTF moment when I spotted a 12 year old Single Barrel on the K&L shelves. This was because I quickly jumped to the conclusion the 15 year old was being phased out. Thankfully I mentioned this on the WhiskyWhiskyWhisky forums where I was told the 12 year SB is simply a new addition to the line up (and it's apparently all ex-sherry matured unlike the 15). That said I'm now worried about the Signature since it's a bit much for Balvenie to have three 12 year old entries in the line-up. Oh, and by the way K&L is charging $69.99 for the 12 year Single Barrel. This means the 15 will most likely get a price bump (K&L was sold out of the 15 at the time so I'm not sure if the price will change). That's a good point. I was wondering why I saw a press release from Balvenie about the Single Barrel. Guess it's because it's now a 12yr. And it's $70. At least the ABV is a little higher. But $70! But then again, the Single Barrel is still listed as 15 years. I would pay $70 for a 12 YO single barrel if it was bottled at cask strength. It'd be a bit high, not so much for a CS whisky. 47.8% is good, but not good enough. Michael, if you ever make it up to Portland, I have a second pack that I'd be happy to pass off to you. I found them up in Washington at the end of 2011, so I'm not sure where else to find them right now. I agree. And I don't mean to be a Morrison Bowmore hack this week but... Glen Garioch's regular 12yr weighs in at 48% and can be found at Hi Time for $46 and K&L for $50. THANK YOU FOR THE OFFER! ALL CAPS! I will indeed make it to Portland this year, though it may be for a weekend rather than the whole week I'd planned (when I was unemployed). Hopefully the whisky bars will still have whisky left by the time I get there. Well, I just tried to special order Signature through K&L and David Driscoll kindly emailed back to tell me Signature is discontinued and can no longer be ordered. Since the Signature is one of my favorites in the range, I'm going to ration the half bottle that I have left (and move it to small containers). Otherwise, it's pretty scarce around here. In case anyone was wondering about that duty free version, Jewmalt Whisky Reviews compared the two. By the way, any plans to review Cragganmore Distiller's Edition which is the last port finished whisky I'm familar with? Thanks for the link! I somehow missed his review of those. He seemed to get a lot more pepper bite in his. Apparently ol' Portwood took out her dentures for me. I'll end that metaphor right there. If I can source a sip of the Cragganmore DE, I would love to review it. I like its old school 12yr better than the two older Cragg indie versions I've had. Before I'd review it though, I need to make sure that my palate is taking to the finished whiskys better. Will be exploring sherry and port this year to work that out. I've also forgotten that Bushmills 16 year old is also finished in port casks. Sounds like it's time for another Irish whiskey review ;).